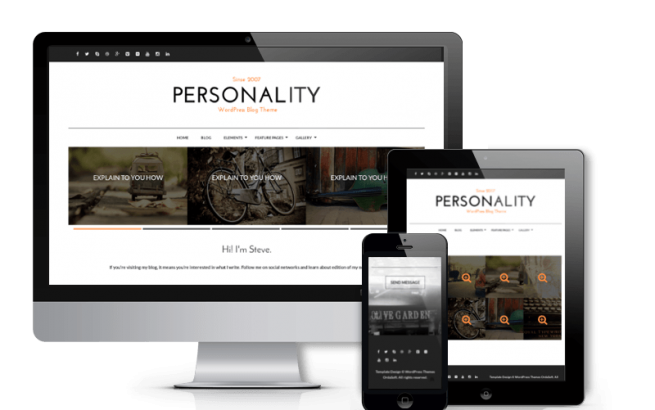 Personality is simple but yet impressive Personal Blog WordPress theme. Suitable for all kind of blogs - personal blogs, diaries or any other blogging websites. The WordPress theme has beautiful typography and excellent effects. The theme options will let you change logo and favicon, footer, font styling, insert your social links, copyright and much more. The responsive design is looking great on any device and it will resize according to your screen. QuickStart package will help you to get the same website like on demo page, so don't wait anymore and start creating your awesome WordPress personal blog website.